If your backroom areas are over crowded with retail "off the shelf" cleaners, leave your profits on the shelf! Joshen's chemical dispensing products are used to safely and accurately blend chemicals and water for a variety of applications, including housekeeping, food service, food processing, dishwash, commercial cleaning, laundry, and car wash operations. So if your backroom areas look like this or you use concentrates but not proportioners, then contact Joshen today and we'll perform a cost-in-use analysis so that you can see the dramatic savings you could realize by implementing a concentrated cleaning program with dispensing options available from Joshen. Watch this video for convenient and accurate foaming, spraying, and rinsing from Hydro Systems Company. Contact Joshen today for all your dispensing needs. Cut your supply costs by using concentrated cleaning, disinfecting & sanitizing products available from Joshen. Joshen also offers many industrial strength cleaning, disinfecting, and sanitizing products for those cases where the application or environment is more conducive to ready-to-use formulations. 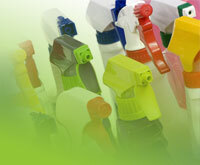 To assist in your sustainability initiatives, Joshen offers a complete line of green cleaning products. Click here to learn more.